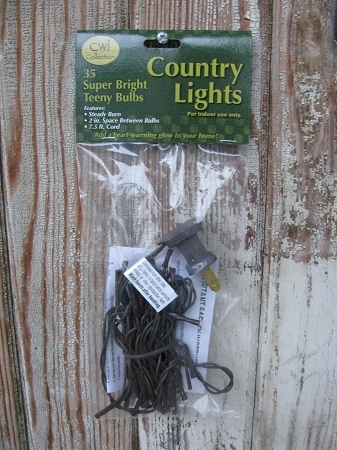 Primitive Country Teeny Country Light Strand 35 Count. These new teeny light strands are awesome. Add to twigs in crocks, angel vine bunch or inside jars...in cabinets and so much more. 35 Count Lights on a 7 1/2 foot brown cord. For indoor use ONLY. Other items featured in second image is the angel vine, a mason jar candle hanger and a 4" battery taper candle. Use on any quart size Mason Jar you own! Use any bowl or container as the bowl shown in not available.